I haven't had a chance to see Abu Dhabi. This is my second trip here and the photograph sums up my experience of this changing city. I zoom around from meeting to meeting and back to the hotel in the evening for a flight the next day. 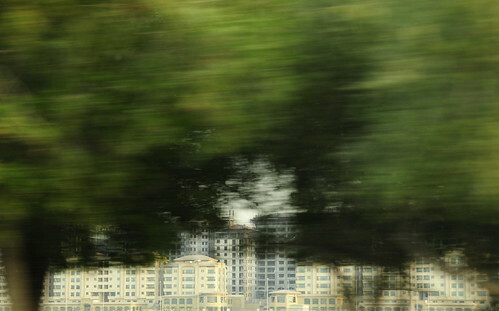 Driving out of Abu Dhabi, I saw Khalifa City. This is four phases of houses after houses and more. The other side of the highway has office blocks and apartment buildings. Malls and leisure facilities are all around. Huge road bridges connecting the two sides are being constructed. Reem Island is another massive development with everything that you can imagine (and some that you can't). Good luck Abu Dhabi. My absolute favorite sight today was the Grand Mosque. The driver was going fast so I couldn't get a good shot. It's definitely on my list of photographs for my next trip. I hope I get more time. Yes Dubai and Abu Dhabi are booming big time, massive and breathtaking construction sites, all you see in the horizon is huge cranes, feels like a machine planet, kind of like in the movie War Of The Worlds... Once i stayed in the Hayatt Regency in Dubai for a quick business trip, I could see the construction of the Palm (don't know which one of the two) right in front of me, massive amount of boats firing sand in the ocean, it was insane! It is insane... I've seen those boats. The islands are completed and they're building houses and hotels on top now! The trees almost look like they've been sketched on, I like. Thank you. There was a little traffic then so the driver was doing about 50km/h. I took 4 shots and this one worked. Where is your blog? I've been trying for a few days.